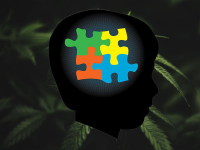 This article discusses the compelling results from using a highly concentrated CBD cannabis oil in terminating or significantly reducing seizure activity in children suffering from rare and intractable seizure disorders. Right now, there is an overwhelming need to find a medication that can help a significant number of children who suffer from one of these rare disorders. What makes this an even greater emergency is the simple fact that these seizure disorders are so rare that drug companies are not usually interested in developing drugs to treat them. That’s for a New Drug Application. Well, we already have the “new drug” it’s called CBD. Or in this case it’s a special high-CBD concentrated preparation called Realm Oil. 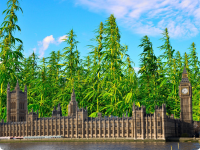 That’s only a hiccup in our discussion since it matters little to those children who experience a complete cessation of (in some cases) hundreds of seizures per day using Realm Oil. Moreover, these children are taking as many as three or four currently available antiseizure medications together. These antiseizure medications have many powerful side effects. In real time, we have and can use, cannabis drugs to effectively suppress seizures where nothing else seems to help. 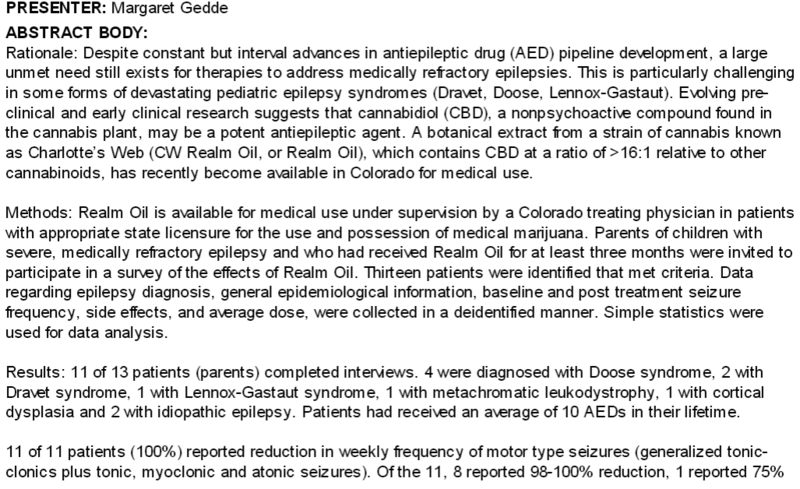 This study offers more persuasive evidence that CBD is an extremely effective drug for treating refractory seizure disorders, and in treating status epilepticus (which we will discuss on a different day). In the abstract there were 11 children of 13 whose parents completed the survey: 4 children were diagnosed with Doose syndrome, 2 with Dravet syndrome, 1 with Lennox-Gastaut syndrome, 1 with metachromatic leukodystrophy, 1 with cortical dysplasia and 2 with idiopathic epilepsy. Realm Oil is an extract of the high-CBD strain of marijuana called Charlotte’s Web. 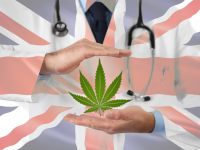 As such it is only available in states such as Colorado for patients who possess a state medical marijuana license. Dr Margaret Gedde reviewed the clinical data on 13 children with severe refractory epilepsy who had received on average Ten Anti-Epilepsy Drugs. The children were then treated with Realm Oil for seizure control at doses ranging from 4 to 12 milligrams per kilogram per day. So, for example, a 40 kilo child at 10 mg/kg receives 400 mg total that day divided into three doses. The oil was used for at least three months. Results of three months of treatment with high CBD Realm Oil showed that all 11 children (100%) had a reduction in motor type seizures, [here they refer to the classic tonic-clonic seizures, the type frequently presented in Hollywood films, and several others involving limbs or facial muscles]. The survey concludes that 8 reported near 100% reduction, which translates into 73% of the participants! 1 patient reported 75% reduction, and 2 reported 20-45% reduction. 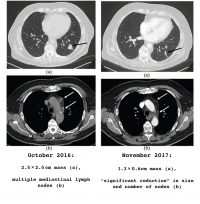 Seven of 11 patients achieved this reduction within the first month of treatment. 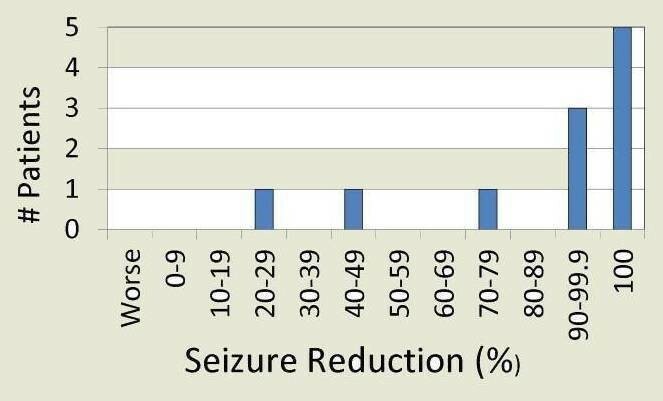 At three months, 5 of the 11 patients (50%) were free of seizure activity. From this summary we can see that five were completely free of seizures after three months’ time. While 11 out of 13 responded favorably. We do not know about the other two that didn’t respond to the survey questionnaire. This study should awaken those neurologists who may be asleep at the wheel, to the enormous potential using CBD to eliminate seizures where no pharmacologic therapy has been able to do. I should add that since one can obtain CBD oil anywhere in America, anyone can try this with their child. You do not need to be in a marijuana friendly state for this kind of therapy. That’s very important for patients to know. This study is sufficient proof that we have a drug that appears to be more effective than any known antiseizure medication on the market.